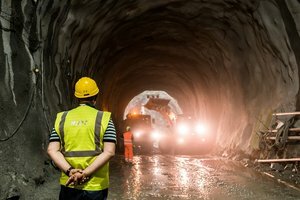 The construction of large infrastructure works such as the Brenner Base (railway) Tunnel are an opportunity that should be used to carry out studies and research on technical, management, legal and administrative issues that can help to develop knowledge in the field of infrastructure engineering. Large infrastructure projects should be used as field training for young and less young personnel to gain useful knowledge, at both a pre- and post-graduate level, which has been proved to be effective many times before. There is no doubt that if training remains at a merely theoretical level, even with occasional visits to a construction site, it will never reach the effectiveness of field training which can only be obtained via internships on important construction sites and as a part of work teams active on these sites. However, if field training is supported on good theoretical groundwork imparted by professional teachers, the results are undoubtedly even better. It is for this reason that the company in charge of the Brenner Base Tunnel, “Galleria di Base del Brennero – Brenner Basistunnel BBT SE”, promotes and encourages cooperation with Universities of any country. Starting in 2009, BBT SE has already signed cooperation agreements with universities and research institutes in Munich, Vienna, Leoben, Innsbruck, Bolzano, Trento, Verona, Padua, Milan, Bologna, Cagliari, Naples, Rome, Pavia, and Turin to promote the best possible links between theory and practice. As part of these agreements, many university students or new graduates have taken an internship at our company in recent years for periods varying from 4 weeks to 6 months. Over 30 theses, masters’ theses and 4 doctoral works have been written by students’ from several countries on several aspects concerning the Brenner Base Tunnel. As of next March, a new II-level specialization course will start at the Federico II University of Naples, in cooperation with BBT SE, entitled ““Geotecnica per le infrastrutture” (GE.INFRA) [Geotechnics for Infrastructure]. This course is meant to train civil engineers already highly specialized in geotechnical engineering and able to handle the planning and construction phases for large-scale and highly complex geotechnical works, such as are required by large infrastructure projects.